Several boys can be seen in facemasks and hospital gowns, at least one giving a peace sign for the camera. The boys lost on average 2kg (4.4lb) during their ordeal but are said to be in good physical condition. They will remain in hospital in the nearby city of Chiang Rai for a week, followed by a week's recuperation at home. 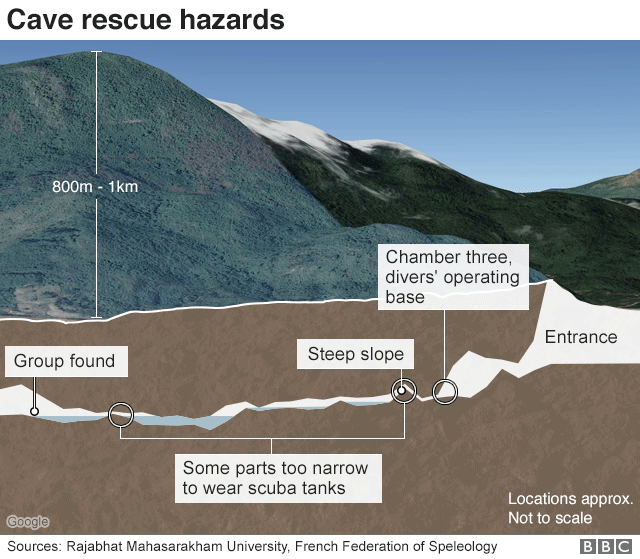 There were cheers around the cave as the dozens of divers and hundreds of other rescue workers involved in the operation left the site. 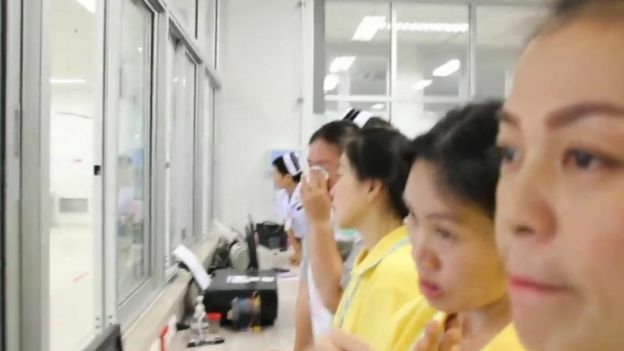 In Chiang Rai, the news was greeted by the honking of car horns while people gathered outside the hospital broke into applause. 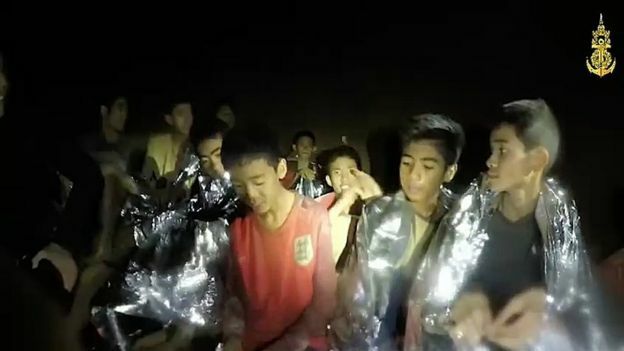 Aged between about 11 and 17, the members of the Wild Boars football team entered the cave system in dry weather, during an excursion with their coach. 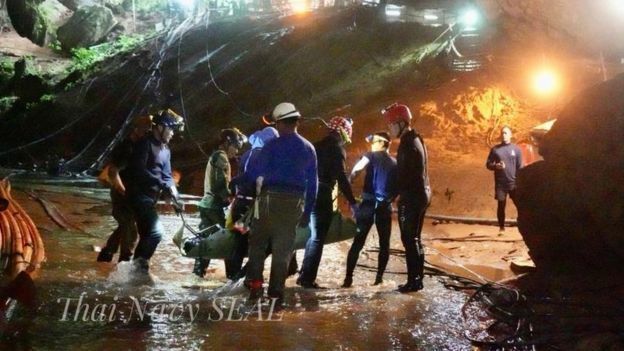 The group was cut off on 23 June after heavy rains flooded the cave complex. They were huddled in darkness on a ledge when they were found by British divers. Elation at the discovery of the group quickly turned to concern as it became clear how difficult it would be to rescue boys who could not swim and had been weakened by their time underground. Getting to and from the chamber where the group were trapped was an exhausting round trip even for experienced divers. The process involved a mixture of walking, wading, climbing and diving along guide ropes. How did the boys survive? The boys and their coach were trapped underground for a total of 17 days. 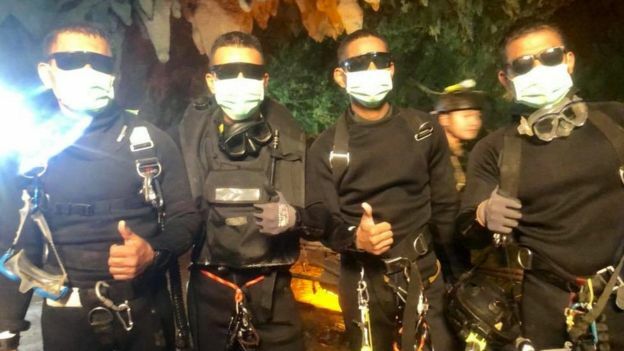 They reportedly entered the cave to celebrate one of the team's birthday, and the snacks they brought with them are thought to have helped sustain them. Once found, they were given "easy-to-digest, high-energy food with vitamins and minerals, under the supervision of a doctor", said Rear Adm Arpakorn Yuukongkaew. Authorities said they seemed to cope well with the mental strain of their time underground. Rescue teams brought them lights and letters from their parents to help them cope. Their coach, Ekapol Chantawong, reportedly taught the team how to meditate to cope with the stress. He trained for a decade as a Buddhist monk before turning to football.